I came across your blog this morning and saw the post on ‘We shall not forget them’ to pay tribute to our fur babies. My black Labrador, Max, crossed the Rainbow Bridge on November 28th. He’s on my mind all the time and I have constantly been trying to do little things that make me feel his presence. I was hoping I could pay a tribute to him on your blog. Please find a small poem and a portrait of him that I had penned down earlier. This is the original picture I sketched of him. The email came from Samyuktha Sridhar and it is a wonderful honour and privelege to offer Sam’s tribute to Max. Max, our handsome black labrador who was eleven and a half years old crossed to the other side of the Rainbow Bridge on 28 November, 2016. We miss him like crazy and it hasn’t yet fully sunk in. There is no way we can make the pain go away, but we need to move on and learn to live with the beautiful memories. Every person has a different way of dealing with loss and sadness. I like to put my thoughts on paper. It helps me get things out of my system. So here’s what I did..
Would it have made it easier, if we had that chance?” I’m torn! I’d have cradled your head upon my lap, stayed by you as you lay. Were you in pain that fateful night, when the big brown clock struck three? Sadly I’ll never know, would I? If you’d reached out to me. You took a piece of my heart with you, the piece that belonged to you. Again and again we are reminded of what our dogs mean to us. So beautifully expressed by Sam. Please, if you want to offer a tribute to your dearly departed dog do share it on these pages. Samyuktha – I am so sorry for your loss! I understand what you are going through. We lost 2 of our dogs 1 right after the other. It is hard. I won’t say the pain will go away. There isn’t a magic pill but just know that your friend walks beside you. You are never alone. Dear Susan, I saw your post about Sophie and it broke my heart. The memories bring a smile and a tear at the same time. I think our fur babies bring out the best in us, wont you agree? Yes, they do! That was my way of thanking her for all the years we spent together. I appreciate your kind words. So sorry to read this 😦 Tme makes it easier to handle and I truly believe that given enough time, we’ll catch up again with every dog we’ve loved and lost and be free to swim and go on endless walks through woodlands and pick apples from trees and enjoy being with our best friends all over again. Thank you for your kind words. It’s weird when you want to hold on to all those memories and move on at the same time. But I believe what you said. Have you read the poem ‘The Rainbow Bridge’? Its beautiful. My heart goes out to this family for their loss. It is something you just don’t get over, but eventually, you will know these beautiful beings will always be with you. My deep sympathy goes to this family. Oh Wow.. Please pass on to Samyuktha Sridhar that I am so sorry for their loss.. But what a wonderful tribute to remember Max by..Such a creative poem and lovely image..
Dear friends, I have no doubt that Sam will be reading your beautiful responses; may well have done already. Paul, I feel overwhelmed and humbled at the same time. What you’re doing here is beautiful beyond words. Thank you! Sam, all I am doing is holding up a large mirror, metaphorically speaking, that reflects back the unconditional love that flows between dogs and the lovers of dogs. You have no idea what a joy it is, reinforced by your loving words and the words of so many others. Sweet depiction of a beloved animal. 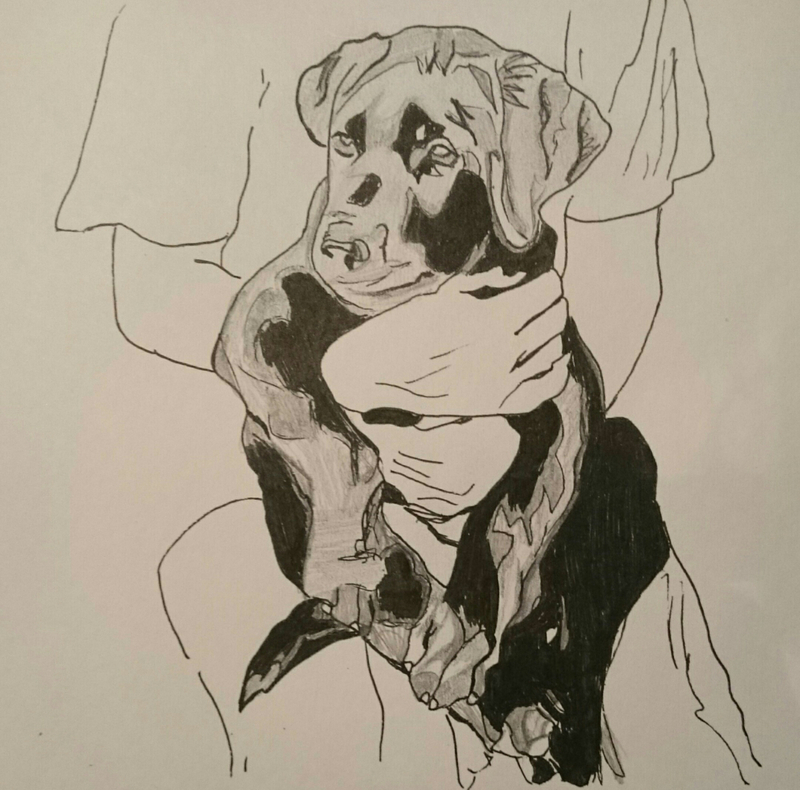 We’ve had portraits done of all of our dogs. They hang on various walls, never to be forgotten. Aloha. That sounds nice. How many dogs have you had? We’ve had many dogs over the years. Most lately we had 3, then lost our sweet hounddog 😦 Now two. 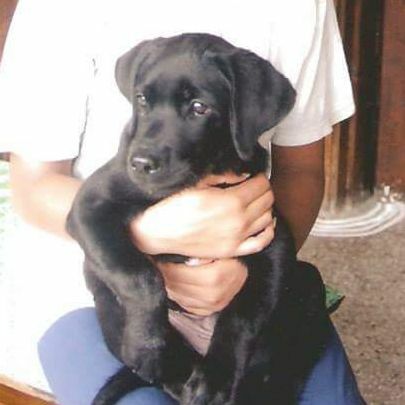 I am so sorry Samyuktha, for the loss of your handsome lab. The poem is quite beautiful and made me shed some tears. The photos contain the beauty of your dog. I believe the spirit of our pets lives on and he will always be a presence even though you are not aware. I lost my handsome chocolate lab, Muddy in August and I have yet to bring myself to blog about him. I do have a story about his rescue (by me) and some pics of him on my blog, though and one day I’ll be able to address my grief. I hope that you are doing ok and that your painful grief will diminish in time. Remember that he will be always be a part of you. Yvonne, when you do pen your tribute to Muddy it would be an honor to publish it here. Would love to see pictures of Muddy and know more about him Yvonne. I believe what you said about their presence in our lives. Thank you again. Looking forward to your story, whenever you feel ready for it. Beautiful thoughts for a beautiful friend, Max. Very well expressed, Sam. Wow, my heart goes out to Samyuktha Sridhar on the loss of their furry family member. Such heart ache when you love such unconditional love. Losing a furry family member is never easy. The biggest thing I have learned is that the more loss that is felt. The more love that was there is begin with. So much love leaves a big whole in your heart as well as your life. It never gets easier. …. Beautiful and heartfelt tribute. Thank you so much for sharing something so personal with so many. May this help you find peace in dealing with such an enormous loss. Another remarkable and lovely tribute for a special dog. My sincere condolences to Max’s peeps and everyone who was touched by this special boy. Love the tribute art!